It is entirely understandable! Here we are, nice and loving and compassionate people much of the time and yet all with our particular brands of greed, desires, anger, rage, and dissatisfaction. The spiritual heroes, the saviours, gurus, buddhas, and bodhisattvas, who are so compassionate that they would die a million deaths to save all sentient beings, well they sort of put us to shame. So there is always that invitation, to leave the ordinary mind behind, and become someone really beautiful, special, wise, and serene. I tell you that it is a false invitation. All such invitations based on the glamour of mysticism and charismatic gurus are false and counterproductive. They are premised on the assumption that implies subtly that someone outside of yourself will take you to Heaven or Truth or help you attain Nirvana or Moksha or whatever. Your own beauty far surpasses the spiritual heroes you may have read and heard about. After all, the great saints, buddhas, yogis, etc., exist only in your imagination. But it is your existence as yourself that gives them life in your imagination. Listen carefully. The ordinary consciousness itself holds the key to freedom. Your ordinary consciousness! Your personal ordinary consciousness! You take it for granted because it is in such abundance. Our ordinariness is so abundant that no matter how much we spend everyday, we have plenty left over! It is an inexhaustible treasure house! “Aham Brahamasmi – I Am Brahman”. It means that I Myself Am the Infinite! The difficulty is that we are not convinced. This ancient statement appears completely outrageous! We run from this because deep down we feel that we are just ordinary, fragile, confused, and needy people. This is where meditation, contemplative prayer, enquiry, and other types of spiritual practices comes in. Their role is to quiet your mind and to make it more conscious and alert to its own nature. This spiritual practice must take place in your ordinary consciousness. The only thing that can truly convince you to the depth of your Heart, is the Recognition of your own beauty that the ancients called Sat-Chit-Ananda, the Pure Existence that is Self Existence, Self Knowledge, Self-Bliss, as One Homogeneous Whole with no differences anywhere. Other things may be helpful. Reading the sacred texts, listening to the words of the wise, and meditating on them is all good. But the Recognition of Yourself as the Heart is the only thing that can convince you. Everything else provides only temporary solace. Do they not say that man was made in God’s image? The pure essence of Man has the quality of God. Well here we are! It is the Self shining as consciousness and reflecting off the mental tendencies appearing to assume the form of our personality. If with the mind, you look at the mind, patiently, through sorrows and tears and joys and laughter, through the exaltation and humiliations, the lucky breaks and tragedies of your life, you will look through your mind, and you will find yourself as yourself as the very look itself. And there will remain only this looking, and it cannot be named, because it is only you. Name is given to you by others. But it is only you, in pristine nakedness and purity. You can call it Seeing without seeing, Being without being, Knowing without knowing. It is the Self Clarity that ancients called Sat-Chit-Ananda. Sri Ramana has said that in the case of Self-Knowledge, “Seeing is Being.”. There is no separation. If you revere your ordinary consciousness and recognize it as precious and remain aware holding quietly to this feeling of “I Am” , that becomes your way and you can throw away your crutches of religion and spirituality and buddhas and gurus and so on. All mystical experiences will come and go and hidden in this ordinary consciousness, you will reveal yourself to yourself as the Self. This is why they say that the ordinary mind is the Buddha mind. Your ordinary mind is the Buddha mind! 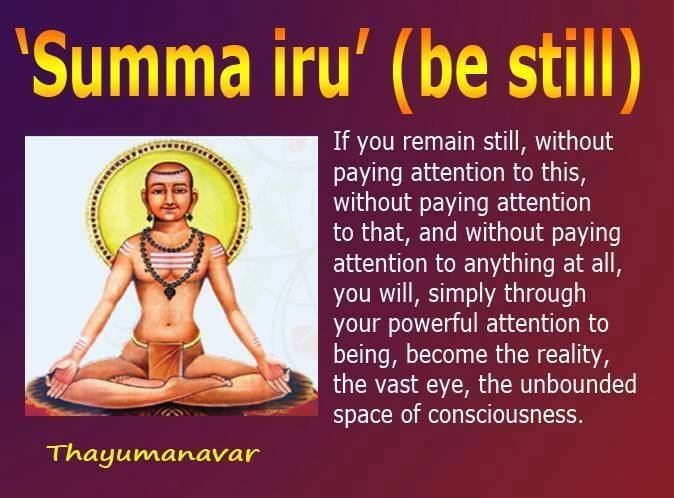 However, Ramana has said that when the devotee is ready a guru manifests on the outside which who pushes the mind inward while the inner guru pulls it inward. We can’t throw away the ladder until we have climbed the steps when we have no use of it. The ladder is as unique as the individual and it is spiritual ripeness and discernment that will lead the true aspirant on the right road not to wonder off into folly but use each rung as it is presented to reach the goal. Even as the goal is always there. It’s a journey without distance but still there is a journey back to the True Self which requires powerful catalysts at time to burn away the murky layers of ignorance. But I do agree with all you say.